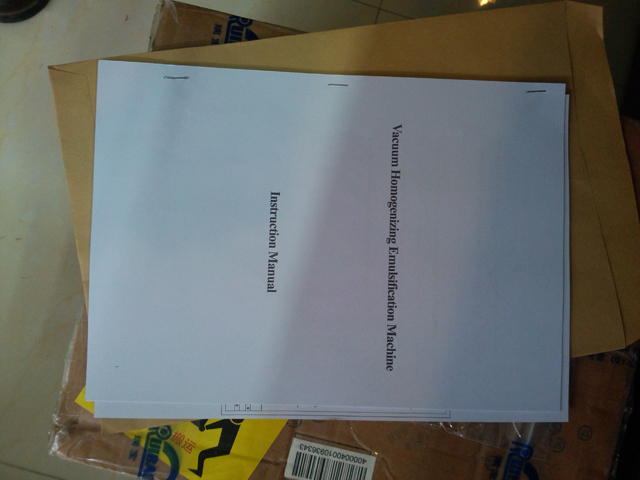 Please study this manual carefully before operating the machine, you are welcome to call our service department or check in our website for any inquires if you can not find any answer in this manual. Operators must be well trained by our authorized technician before operating the machine. The instruction manual is only supplied for your reference. We will not give further notice if any alternation is made. We reserve the right to vary this manual without prior notice. Please keep this manual carefully for future application. 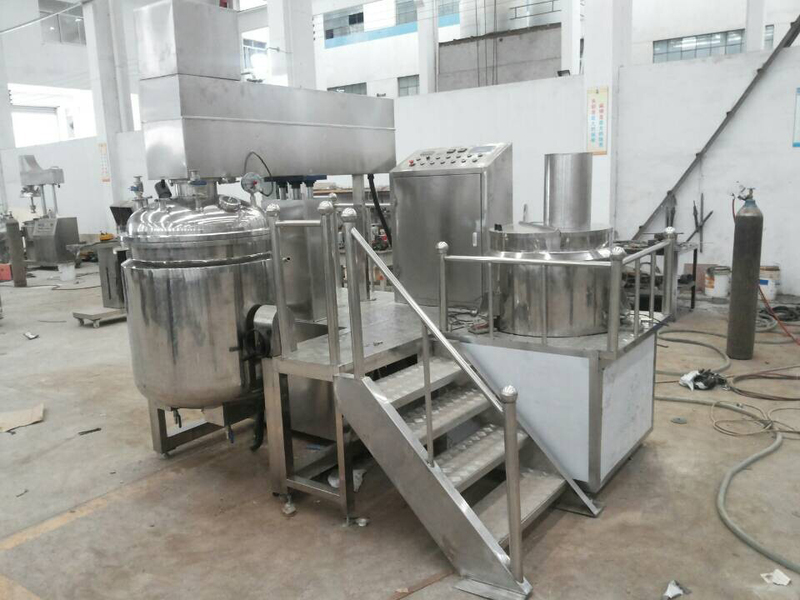 YX-VME350L vacuum emulsifying unit is mainly consisted of main pot, grease pot, water pot, electric control panel, hydraulic system, vacuum system as well as the framework. 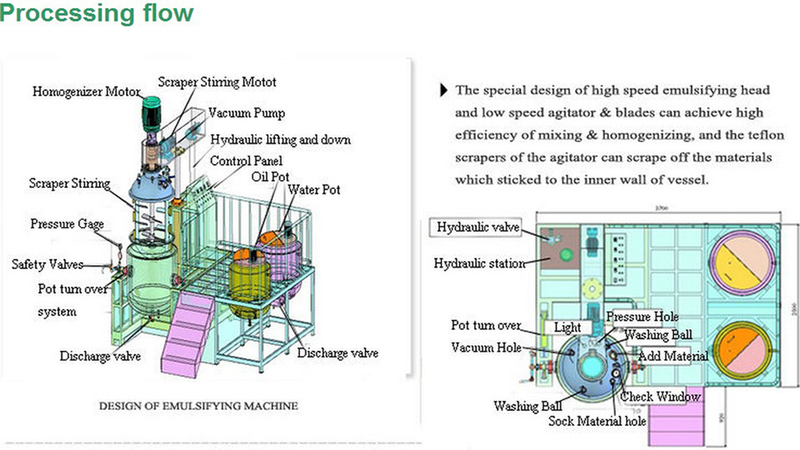 The main pot includes isotropic stirring pot, the Homogenizer unit and bidirectional mixing tools. The material is preheated and stirred in water and grease pot, and then will be leaded into the homogeneous pot in vacuum situation by the conveyor pipe. 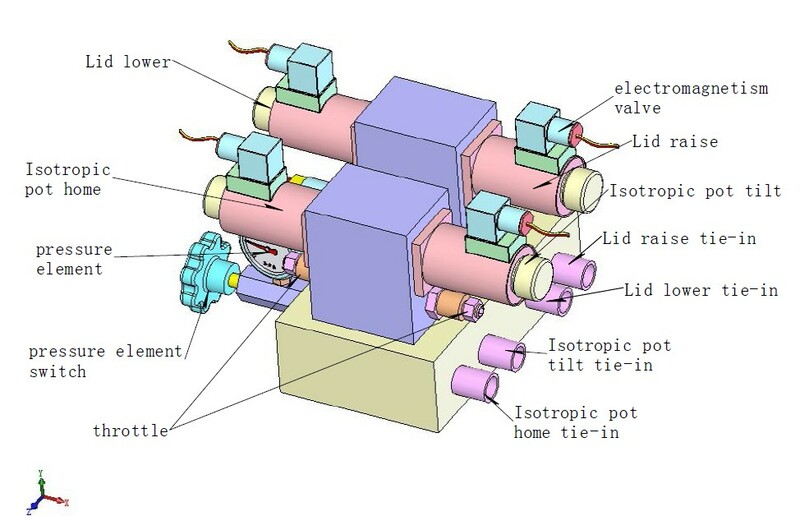 The material is stirred in the homogeneous pot. There is a Teflon scraper (scraper throughout to cater to pot shape, sweeping material sticking on the wall), unceasingly producing the new interface. The frame agitator and its reverse stirring leaf are operating by cutting, compressing and folding to stir and mix the materials which will flow down to the homogenizer. 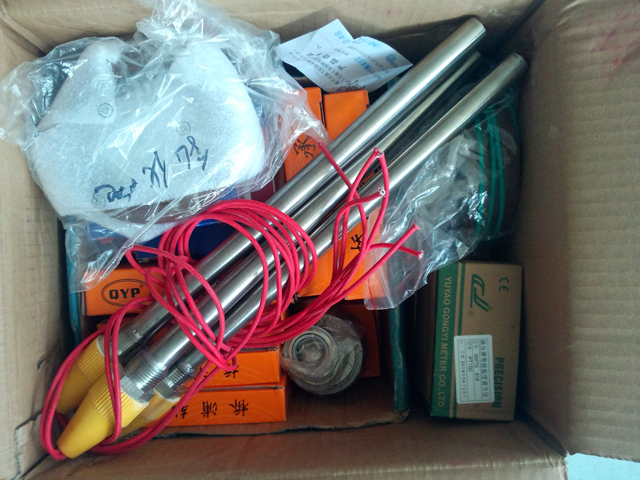 The high speed rotation of the rotor and stator will shear, shock the materials to be sheared in the shear cracks, producing the particles whose size is 200nm～2μm. The pelletizing, emulsification, mixing, homogenizing and dispersion of the materials can be done in a very short time. 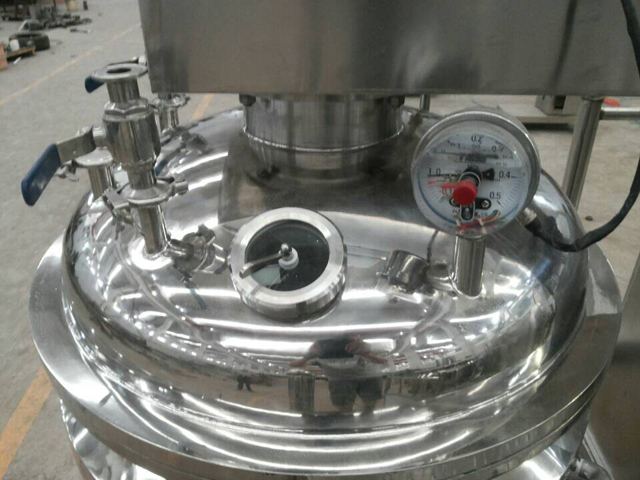 Since the homogeneous pot is under the vacuum state, the bubbles generated in the material during the mixing process will be siphoned quickly. After the homogenizing finished, raise the pot lid and press the dumping button and the materials will flow from the pot to the outer container. (Or you can open the valve at the bottom of the pot and pressure valve to discharge the mixed material directly. 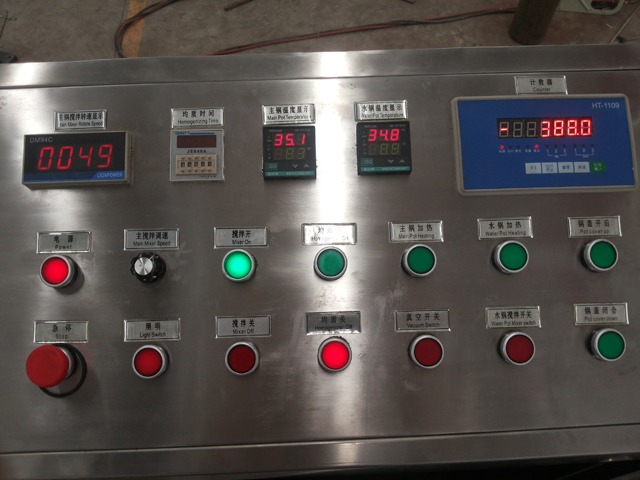 The heating temperature of the homogenous pot is displayed on the temperature controller located on the control panel. Homogeneous mixing and paddles stirring can be used separately or simultaneously. The isotropic frame and blend knife can be used at same time or separately. The homogenizing time can be changed according the material property and the time can be adjusted by customer via the control panel. Open the cleaning ball valve to clean the pot after work. F Please follow the flow chart in Part 4 to operate the system. 1. Since the homogenizing cutter has a very high speed when operating, don’t run it in empty pot in case that parts overheat will effect the pot seal. 2. Ground wire should be connected to the ground to make sure of the electricity safety. 3. Homogenizer is running reversely when we look it from up view. Please jog to try to switch the motor when the motor is connected to electricity or after a long time without running. The stirring frame is turning reversely from the top view. Try to jog the agitator until it runs smoothly and then operate the homogenizer. 4. Joggle the machine to check any unusual behavior of the agitator and scraper before running the machine in full speed. Eliminate machine errors immediately if they are existing. 5. Make sure the pot lid, nozzle cover sealed properly before turning on the vacuum pump. 6. Shut off the vacuum ball valve before turning off the vacuum pump. 7. The vacuum pump can start operation when the homogenizing pot is well sealed. If the vacuum needs to be run under open air for special requirements, don’t run the pump over 3 minutes. 9. Do not put your hand into the pot when the equipment is running. 10. Stop the machine when unusual noise occurs. Check the machine thoroughly and fix the problem before re-starting the machine. 1. Connect the right power supply to the machine and make sure that the ground wire is connected to ground. Turn on the main power and the power indicator will light up. 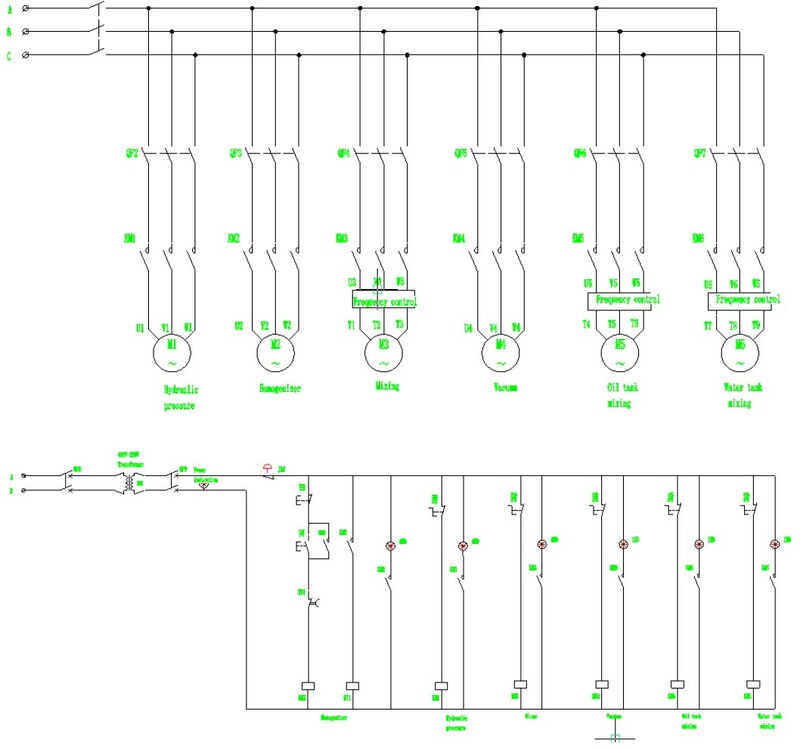 ( Jog to try to switch the motor when the motor is connected to electricity or after a long time without running. The stirring frame is turning reversely from the top view. Try to jog the agitator until it runs smoothly and then operate the homogenizer. ). 2. 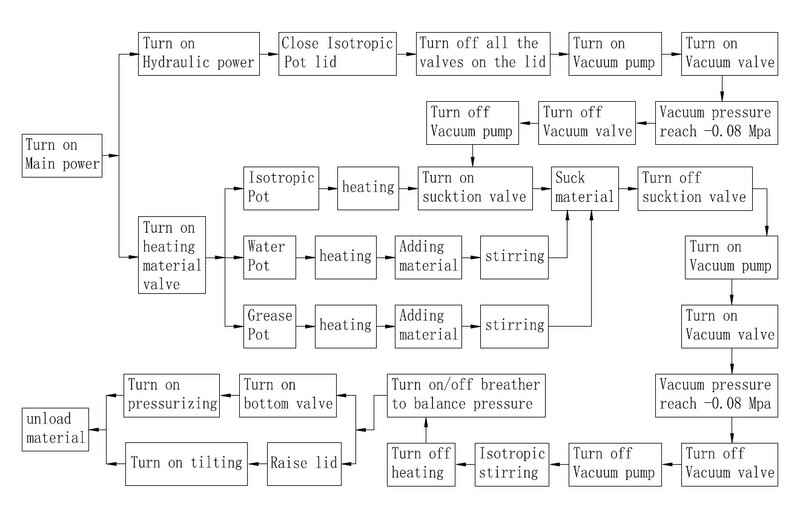 Connect all the hoses on the homogenizing pot in a right way (including overflow hoses, outlet hose and dumping hose). 4. Homogenizing cutting, scraper stirring: Turn on the homogenizing cutter and scraper frame after feeding the material into the isotropic pot. Joggle the motor and check the stirring scraper before start. If there is any errors, stop and machine solve the problems immediately before resetting. 5. The vacuum pump can start operation when the homogenizing pot is well sealed. If the vacuum needs to be run under open air for special requirements, don’t run the pump over 3 minutes. 6. Do not run the vacuum pump without material in the pot. Do not block the pump exhaust when running. 7. Check and lubricate the bearings and other critical components regularly. 8. Keep homogenizing pot clean. Wash the parts where the homogenizing pot is connected with the working fluids in every stop and change of materials, especially the cutting wheel and cutting sleeve on the head and sliding bearings, bushings within the homogeneous sleeve. After cleaned and re-assembled, hand-turning impeller should be no clamping stagnation. Jog homogenizer motor to turn in the right way when pot lid and body flanges are relatively fixed. If no other abnormalities, the machine can start running. 9. Cleaning standards are based on the material property and customers’ specific needs. The hydraulic system has been adjusted properly. There is no need to adjust it by customer. 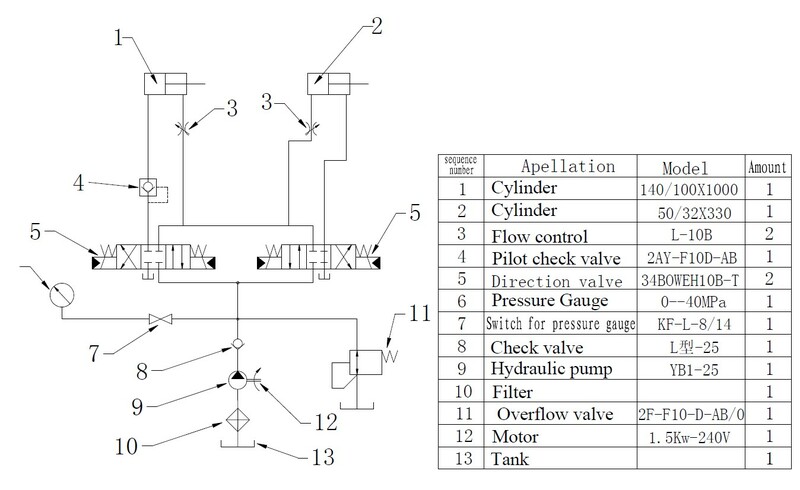 If customer needs to adjust the speed of the lid and the main pot for special purpose, please adjust the valve according to the figure. The machine should be put in the clean and dry warehouse and make sure no corrosive gas around.